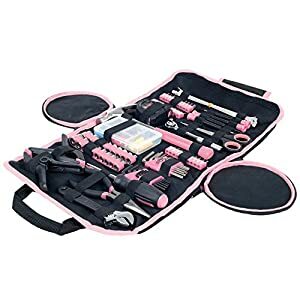 Best Women’s Tool Set Reviews: Top 15 Pink Tool Set April 2019! 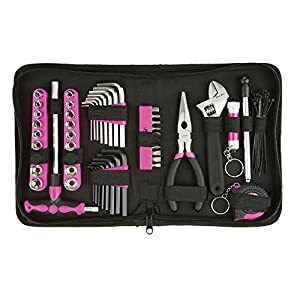 Let’s take a look at women’s tool sets you’ll love! Ladies, the time has come to finally get your personal tool kit and show these men who’s in charge of this household! 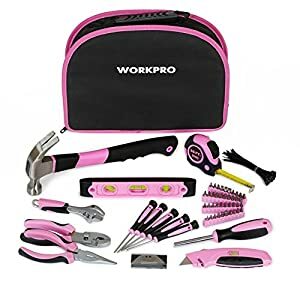 In this article, you will find 15 reviews of various pink tool boxes to help you choose the best women’s tool set – a must-have for every woman who truly wants to be seen as an independent and self-sufficient member of the society. And who said that pink tools are no good for that matter? 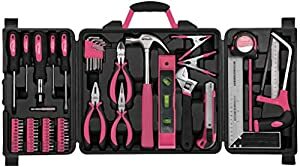 But before we proceed to the actual tools, let’s take a quick recap of what a really practical pink tool box should include, why (and how) the pink color is associated with the girls and femininity, and what “pink” means in 21st century. So, basically, the tool kit (or a tool box) is an assembly of tools that can be used for various purposes. For instance, you need to put up a shelf or a shower holder, or to fix the door hinge or to take off a panel from a device to change the batteries. To do that, you will need a drill or at least a screwdriver. However, to do the shelves or any other kind of mounting, you’ll need anchors. And now imagine making holes for them without a drill! Also, many boxes include hex keys, wrenches, screwdrivers, pliers and many other handy tools – all you need to do is to choose and purchase one. It’s common knowledge nowadays that pink is for girls and blue is for boys. But did you know that it wasn’t like that 100 years ago? Today’s popular media claiming to have studied the subject often refer to the Earnshaw’s “Infants’ Department” 1918 issue, saying that the general rule at that time was “pink for the boys and blue for the girls.” And other sources of the late 1910’s and 1920’s confirm that info. But before that, toddlers had been dressed predominantly in white – it was easier to maintain because at that time there were no efficient washes to prevent the color from fading. What seems like a fair reason for the growing popularity of pink for the girls is the Mamie Eisenhower’s inauguration gown. Many females tried to copy its color in their outfits, and the manufacturers started to use it in their products. This color eventually became known as Mamie Pink. So, the craze started with one dress and took over the 50’s. Pink was everywhere: from curtains and cutlery to bathrooms and dorm designs. Films added to the trend, too! And since 1950’s, homes and fashion were females’ realms, baby girls were wearing this wonderful color, too, just like their moms. Since then, more or less, the gender-biased color trend took its shape as we know it today. Another reason was marketing strategies. After the Second World War, the quality of life was rocketing, and the industries grew, trying to sell as many products as possible so they could make more money to manufacture and sell even more goods. This is how gender-targeted marketing was born. And since pink-for-the-ladies had already been a thing, it wasn’t hard to find a formula to break the stereotype. It became a common practice to make one product in two versions – blue for a man, and pink for a woman – although there could be no difference between them. It was also reinforcing the gender inequality: females were expected to develop an interest in beauty, home, and arts, and males – in sciences, machinery, and sports. Women were expected to be charming and caring, while men – to be ambitious and active. But does a stereotypically male object made in girls’ colors make it any better? Well, in 2018 pink is still strongly associated with women and femininity. There is also an internationally recognized sign – a pink ribbon that signifies breast cancer awareness and is worn by many to show support. But beware – not everything that is pink or features a ribbon has to do with breast cancer or women’s health. As for the men, wearing vibrant colors has always been rather bold. And today, men wearing pink or using pink items may look daring and cheeky. It feels like there is always an underlying question “Are you manly enough for pink?” Like wearing pink is something terrible. However, the color is still just a color, and if a man likes or wants to wear bright colors and specifically pink, many companies allow such option (take Nike, for instance, or Zara). Just look at Tom Hiddleston – he looks fabulous in this pastel pink suit! 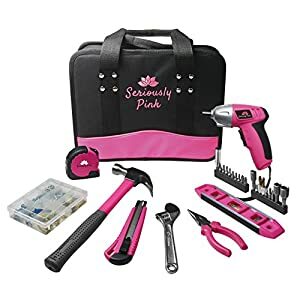 But what if a woman chooses to use pink power tools? In so doing, what kind of statement does she make? And does she make any at all? Does she choose pink because she simply likes it, or is it to express solidarity and show that she is a conscious feminist? 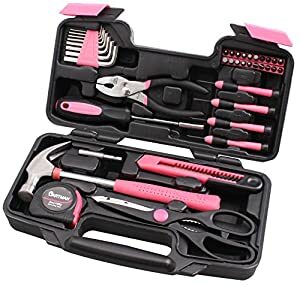 Or is it quite the opposite, and the woman who uses a pink tool set just wants to accentuate her acceptance of a traditional female role of a housekeeper? And can, in fact, a pink tool box signify both? If you haven’t made up your mind yet, and don’t have the answers, it’s alright. Give these questions some time to absorb. and a few more! These tools are enough for basic household carpentry or any other kind of small fix. The tools come in a convenient, rugged canvas case for easy storage and transportation. The case features an inside zippered pocket for smaller items. The great thing about Apollo Tools is that the company participates in the Pink Ribbon program – part of the proceeds that you pay for your new pink tools goes to the Breast Cancer Research Foundation. and many more! There is even a putty knife! How cool is that! 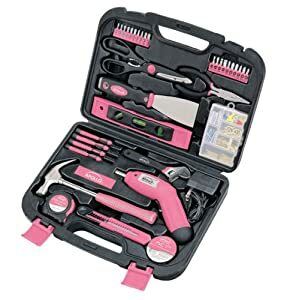 These super-suitable tools for women’s hands come in a sturdy plastic case that allows keeping your tools clean, in place and organized. Although the clasps may be tricky to open sometimes. Also, please note that the screwdriver is most effective on the drywall, but won’t be enough to make holes in the concrete. 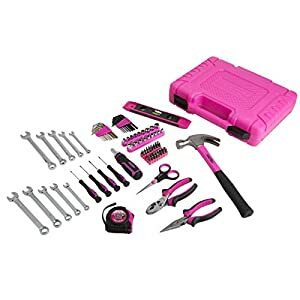 This handy pink women’s tool kit works best for minor repairs. Complied with the most necessary items, the kit will be just enough for almost any quick fix. Please note that these are not contractor tools. and some other first-hand items. The tools come in a soft bag, that, when rolled up, can fit the size of a shoe box! The tools come in a special plastic box to keep your home-repair essentials neat and organized. Although the tools look bright, make sure to keep them out of reach of children and pets. I won’t lie if I say, the story of GreatNeck began in 1919, when the founder, Samuel Jacoff, started a hacksaw manufacturing business. This means that for almost 100 years, this company has been perfecting its tools and services, all to make us, customers, happy and content with what we purchase. An Essentials tool set has been developed and compiled to meet the needs of a homeowner and make their lives easier. and many more! All the tools feature ergonomic handles that help to reduce fatigue and prevent wrist paint. The bag features 18 pockets to fit any other items you may need to add to the set, and a shoulder strap to free your hands. and more! But don’t let the size of the box in the photo fool you – the tools are not a toy for a kid. P.S. : The tools come in a zippered book-like case. and some other excellent properties. 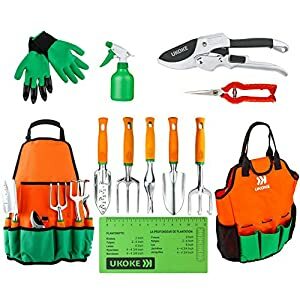 With a tool set like this, you will always have your own personal tools whenever you need them. Additionally, the bright color will prevent them from mixing with those of your husband’s. Isn’t it great to have tools of your own! The case is made in a shape of a book and features a sturdy zipper. Be careful; the elastic restraints may get loose over time. The box is made of blown plastic and is made to last. 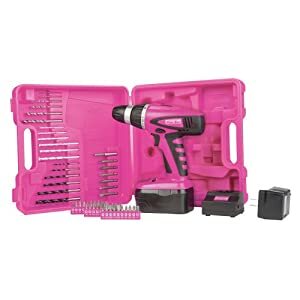 If you were looking for pink power tools, this pink box is exactly what you need. The case includes an 18-V cordless drill with a charger and a varied collection of the driver and drill bits. The tool features both forward and reverse action modes. It may be not the best drill in the world, but at the price\quality ratio like this, a tool is pretty decent and durable. It will be enough for most of the minor carpentry and mounting works. and some other useful items. Please make sure that you keep them out of reach of children and pets, since the small details can be easily swallowed and put your loved ones at risk. The bag opens on the top which allows a quick and easy access to the tools. It also features the inside and outside slip-in pockets for smaller items. and other amazing items. The drill also includes a built-in light in case you’ll need additional lighting. Although it may look like a toy drill, in fact, it’s pretty strong and passes the 6-feet test – an admirable feature for such price! The tools come in a book-like canvas case and feature elastic restraints to hold every tool in its place, and a pair of handles for the convenient transportation. and some other fantastic properties. 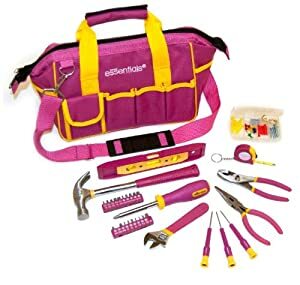 With a pink tool set like this, your home projects will become a breeze. 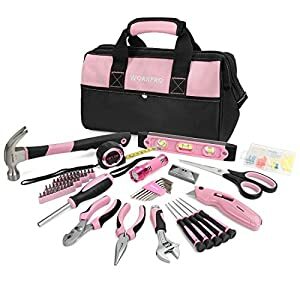 Apollo Tools are a part of the Pink Ribbon program, and by purchasing their products, a part of your proceeds will go to the Breast Cancer Research Foundation. and many more. With these tools, you will be able to cut, measure, adjust and install almost anything in basically no time. Plus, working with your own beautiful tools is such a pleasure! The case is made of sturdy plastic and has 3 sections for easy storage and quick reach. The set comes in a special presentation box, but make sure you order the full set of instruments. Otherwise, you may find your collection lacking some of the items mentioned above. So, as you see, there is a whole world of tool sets that come at different prices and serve different purposes. Hammers, screwdrivers, wrenches and other “manly” things are actually no trick for a woman. And pink color brightens up the routine turning it into the exciting and fun activity! 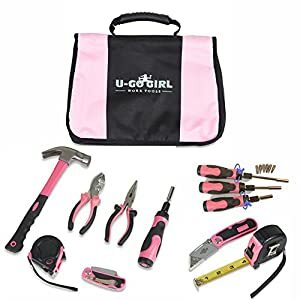 If you’re a woman looking for a tool kit or a man in search of a present for his female significant other, I believe that now you will be able to choose the best women’s tool set to meet any household needs. Hope you found this article useful. 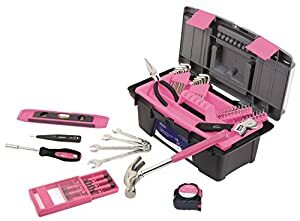 Let me know what you think about these women’s tool boxes and how you feel about the tools being pink! Feel free to leave your comments in the box below.